Here’s what I know—as in what I can report with confidence—about Outerlimits Offshore Powerboats in Bristol, R.I. With the death of company president Joe Sgro in November 2017, the ownership transition has taken longer than anyone involved initially expected. Originally, longtime Outerlimits customer Bob Russell planned to take over the ownership reins. Now, it appears that when all the papers are finally signed the company will go back to one its original investors. 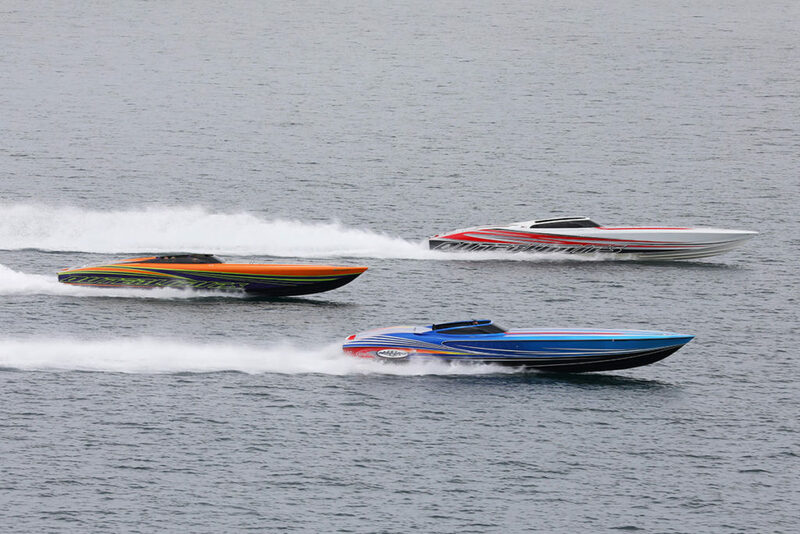 Captured here during last month’s Erie Poker Run, a slew of Outerlimits owners including Vinnie Diorio are expected to bring their rides to the Scene Circle Power Party at the Lake of the Ozarks Shootout in August. Photo by Jeff Helmkamp/Helmkamp Photography. While confusing and perhaps frustrating to those with a burning desire to know the inside story, situations such as this are far from uncommon with privately held companies. Desires shift and plans change. Unforeseen complications arise. Nothing is final until the deal closes. Here’s what I also know based on recent conversations with Outerlimits customers such as Dave Scotto, who has a new 50-footer with an extended cockpit currently under construction under at the plant, and the company’s Dan Kleitz. The company is still building boats. Stephen Miles of Stephen Miles Design has two in his Owensboro, Ky., paint shop, and when they’re finished they’ll be hauled back to Outerlimits for completion of their final details before delivery. Something else I know? The passion for the Outerlimits brand is alive and well, thanks to owners such as Michael “Doc” Janssen, who’ll be inducted into the Lake of the Ozarks Shootout Hall of Fame this year. More relevant to many of the Outerlimits faithful, Janssen is hosting the sixth annual Scenic Circle Power Party at his waterfront home on Friday during the late-August top-speed event. Although the event won’t exclusively be limited to Outerlimits owners, there’s sure to be a slew of them—in addition to his own canopied 53-footer—at the docks in front of Janssen’s home. Scotto’s new ride won’t be among them—he’s hoping to have the boat in time for the Florida Powerboat Club’s annual Key West Poker Run in November. But thanks to Janssen, he’ll be there. Outerlimits SV 43 owner Vinnie Diorio will be heading back to Janssen’s event, which he co-hosted last year with Sgro, as will several of his fellow Outerlimits owners. “There will be a bunch of us going for sure,” said Diorio. Janssen emphasized that although he’ll be delighted to see an array of Outerlimits models at his docks, the party is far from limited to owners of the brand. “It’s a powerboating networking event more than anything else,” he said. “I’m sure we’ll have a dozen or so Outerlimits at the docks, but we’re definitely not limited to them. I have friends who own Fountains and MTIs and everything else. All are welcome.